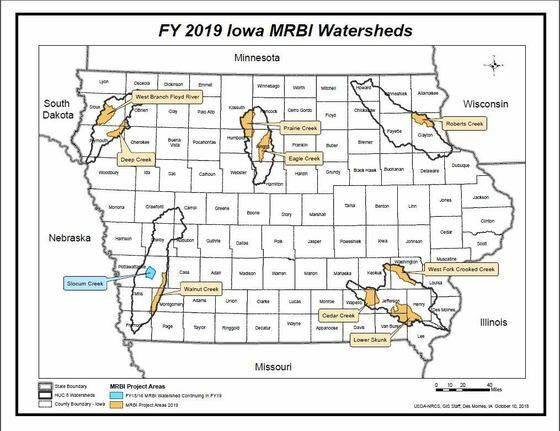 DES MOINES – Iowa Secretary of Agriculture Mike Naig today highlighted $2 million in funding available over the next year from the USDA Natural Resources Conservation Service (NRCS) that will support eight Iowa Water Quality Initiative (WQI) projects. The funding is through the USDA’s Mississippi River Basin Healthy Watershed Initiative (MRBI) and will support practices that help improve water quality. “USDA has been a key conservation partner for decades and we appreciate this additional funding focused on water quality. These are established state-funded, Water Quality Initiative projects that have a history of working directly with farmers and landowners. This additional funding will allow these projects to get even more proven practices on the ground,” Naig said. The funding will support conservation practices that reduce nutrient loss and improve wildlife habitat while maintaining agricultural productivity. Eligible practices include cover crops, bioreactors, grassed waterways, terraces and prescribed grazing. Each watershed project will have specific practices that are eligible. Farmers interested in participating should contact their local USDA office by March 15, 2019.